This is the second of two instalments of fun craft activities we got upto over this half-term. We had just been to watch a free showing of Toy Story the weekend before. J has been so impressed with Buzz Lightyear and rockets ever since that even his little water bottle is now a rocket! He expressed a desire to make a 'craft rocket'. 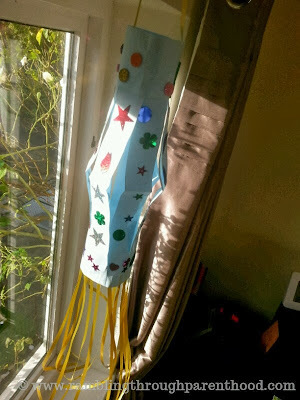 As it was Diwali and we needed to make a paper lantern, I decided to fashion one to resemble a rocket. Not really, no. 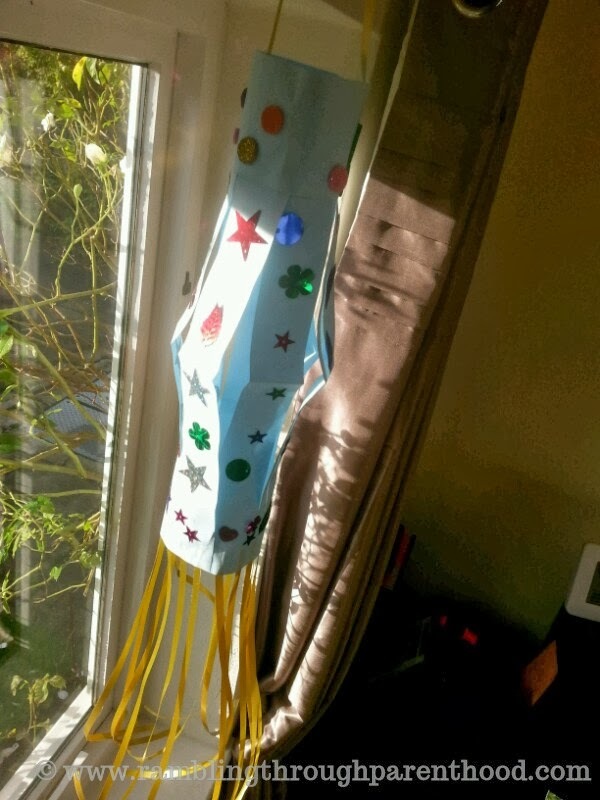 I decided to make a paper lantern I had planned on making anyway, and call it a rocket. There. That's my confession and a load of my chest. We have been going around calling the poor lantern a rocket, when it looks nothing like one. I really, really owe J a proper 'craft rocket'. Soon. Going back to the paper lantern, it really is rather simple to craft. Start with a rectangular piece of paper. Fold it in half. 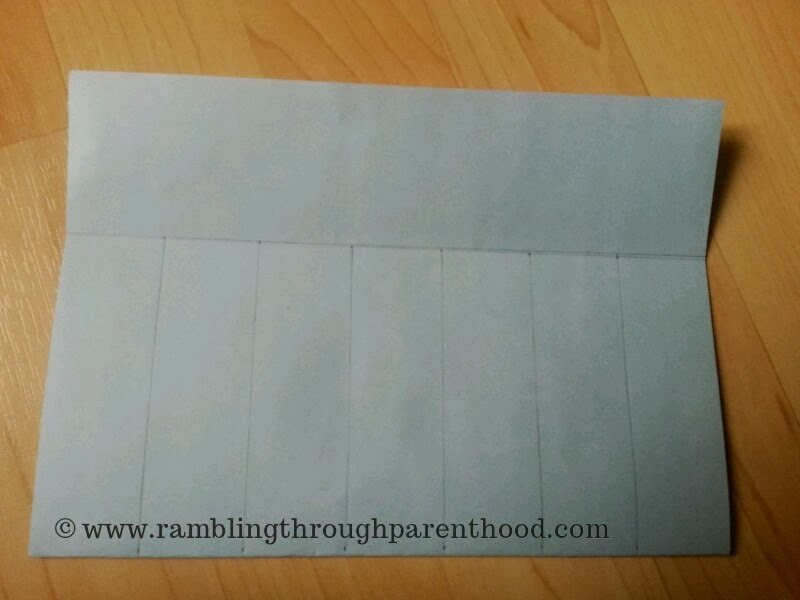 Then fold the free ends inwards and draw a line across to mark this fold. 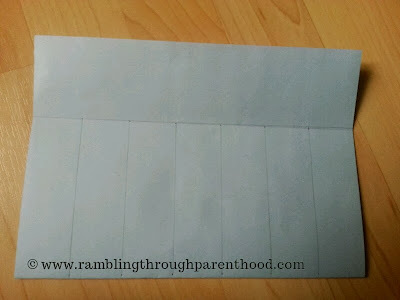 Now draw vertical lines from this fold running to the folded edge of the paper. These should be equally spaced. Cut along these lines and open up the paper. This will give you the base to work on. Now for the fun part, the bit which got J all excited. Whip out the crafting glue and decorate your base paper with anything you fancy. 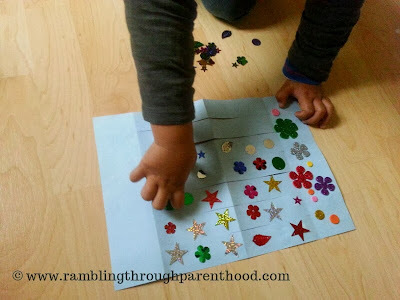 We stuck on pieces of all that was shiny in our craft box. Once everything has dried, flip the paper over. Glue several strands of ribbon along one edge. Wait for the glue to dry. 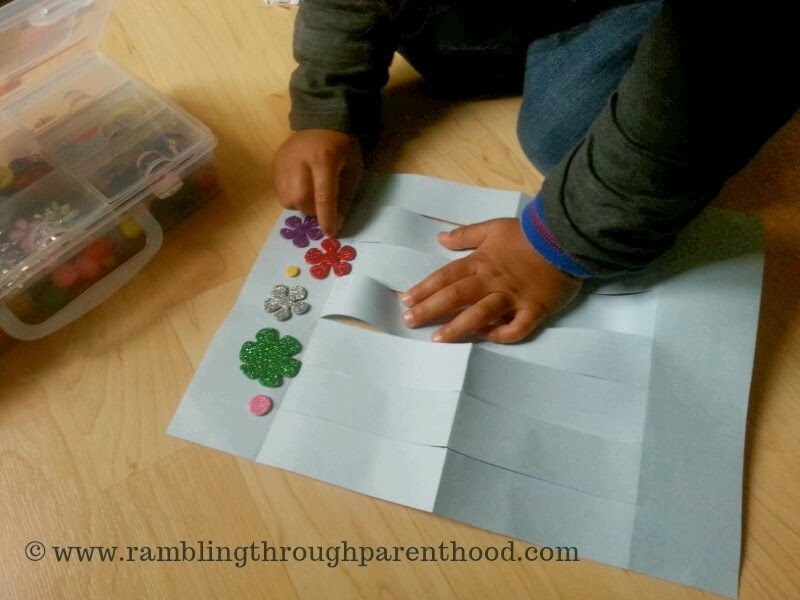 Now gently bring the free edges of the paper together and stick them up. Attach another piece of ribbon to the top. And there you have it. A sparkly paper lantern. We just hung ours up from a curtain rod, and forgot to put a light source inside it. It still shone and sparkled. This is lovely. I have fond memories of making lanterns like that for Chinese New Year when I was little. what a simple idea but it looks great!